Product #46552 | SKU BDA121AA | 0.0 (no ratings yet) Thanks for your rating! 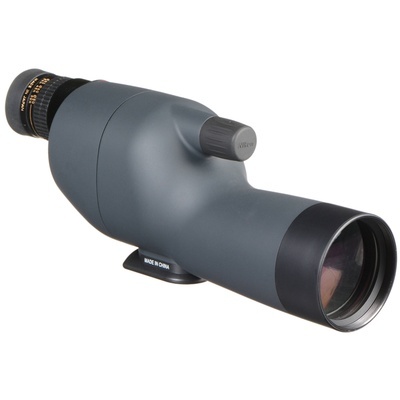 The straight viewing Fieldscope ED50 13-30x50 Spotting Scope from Nikon is a compact and lightweight spotting scope with a 50mm ED (Extra-low Dispersion) objective lens for chromatic aberration. Nikon especially developed ED glass to provide precise optical colour correction. The ED50 scope is offered as straight or angled viewing design. Most users will prefer angled scopes because they are both simple to use for birds perched high above the viewer as well as easily simultaneously shared amongst users of differing heights. But some will prefer the straight viewing models, for these are much easier to use when hunting down the object of interest in the first place. Nikon's Fieldscope line of spotting scopes are premium offerings to compete with the best of sports optics manufactured in Japan or Europe. You choose your options based on concerns for mass and budget: straight or angled, objective diameter, and whether to spring for the ED (extra-low dispersion) glass for more favourable appreciation of highly detailed subjects. All of Nikon's spotting scope line is backed up by the "No-Fault" 25-year warranty. Regardless of what happens to your scope-even of your own negligence-Nikon will repair or replace (at their option) your scope for just $10 plus the return shipping costs.